All transactions are safe and secure with a reliable history in online purchasing behind each of our associates. 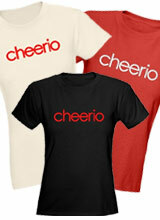 Buy the Cheerio t-shirt to own Glee clothing and merchandise. Not everyone in the world can be Gleeks; some people have to be Cheerios. It is as simple as that. These Cheerio t-shirts are for anyone who is proud to be a cheerleader rather than a glee club member and who wants to cheer it from the rooftops. This tee features Glee style lettering in the William McKinley High School colors of red, white and black with an added gold option. The design is available in a variety of styles for men and women. Pair it with a matching skirt for the perfect Glee Cheerio costume. Your friends can create alternate Glee costumes and together you can become Cheerios. In addition to the Cheerio tee above, browse the Glee Clothing Gallery for more apparel like men's and women's clothes, kids shirts or hoodies.